this is the motto of "NATTYABED"; a newly formed theatre group in Dhaka, Bangladesh; which believe in creation and change. This theatre group is formed by some young students who are dedicated to theatre. They love theatre and want to show more and more creativity in Theatre. 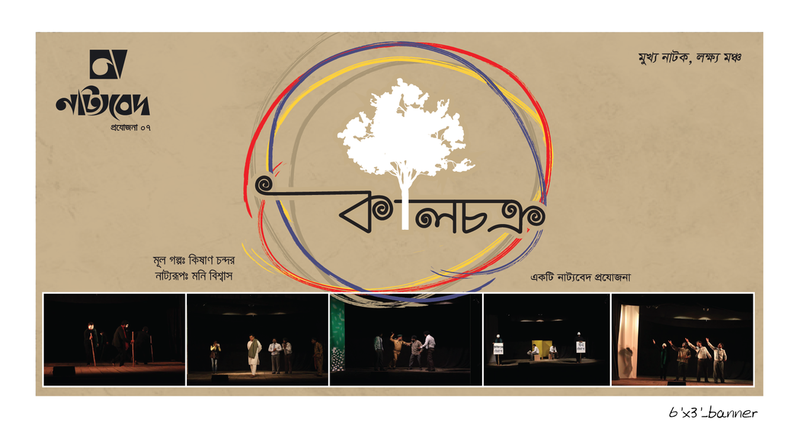 23 December 2018: Nattyabed performed the 2nd show of "Kalchokro" in Studio Theatre Hall, Bangladesh Shilpakala Academy. The original story was written by Krishan Chandar who was a Urdu and Hindi writer of short stories and novels. It was an Improvised production of Nattyabed. Music Direction and set by Deepak Roy. Props by Mirza Samrat, Costume design by Rabeya Rabu. The Show was performed by Mirza Samrat, Ahmed Shopon, Nur Islam Tipu, Mustafizur Rahman, Ansar Ali Limon, Jahirul Islam Jahir, Pavel Kumar Saha, Kanon Ahmed, M.H. Palash. 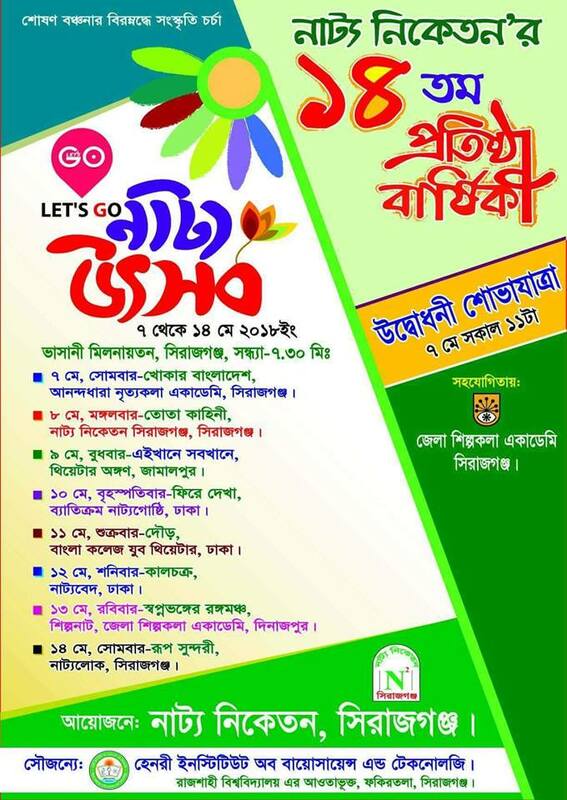 Music Operated by HS Mithun, Harmonium by Rabeya Rabu & Rhythm by MustafizurRahman , Light operated by Saikat Chowdhury. 07 June 2018: Nattyabed arranged the Anuual Iftar Mahfil in Bishwa Shahitya Kendra. It was a nice gathering by the members, well wishers and the guests. After Iftar the new Executive Committee of Nattyabed for the next 2 years has been announced. 12 May 2018: Nattyabed was invited by "Natto Niketon, Shirajganj" to attend their 14th Anniversary. Nattyabed performed the OPENING show of "Kalchokro" in Bhashani Milonayoton, Shirajganj. The original story was written by Krishan Chandar who was a Urdu and Hindi writer of short stories and novels. It was an Improvised production of Nattyabed. Music Direction and set by Deepak Roy. Props by Mirza Samrat, Costume design by Rabeya Rabu. The Show was performed by Mirza Samrat, Ahmed Shopon, Nur Islam Tipu, Rabeya Akter, Nazmul Haque Nehal, Jahirul Islam Jahir, Pavel Kumar Saha, Muyeed Sumon, M.H. Palash. Music Operated by HS Mithun, Rhythm by Peter Tuhin Bairagi and Prabir Nokrek, Light operated by Saikat Chowdhury and Priyota Parma. 10 May 2018: Nattyabed performed the technical show of their 7th Production "Kalchokro" in Studio Theatre Hall. Its an improvisation of Nattyabed. The original story is written by Krishan Chandar. The Show was performed by Mirza Samrat, Ahmed Shopon, Nur Islam Tipu, Rabeya Akter, Nazmul Haque Nehal, Jahirul Islam Jahir, Muyeed Sumon, M.H. Palash. Music Operated by HS Mithun, Rhythm by Peter Tuhin Bairagi, Light operated by Saikat Chowdhury and Priyota Parma. 27 October 2017: Nattyabed celebrated their 9th Anniversary in Sanskritik Bikash Kendra. 1st June 2016: Nattyabed performed 7th show of "Kamalakanto" in "Shoptoborna Natto Utshob" arranged by Natto Chokro, Dhaka on 1st June. The 7 days Festival with 7 plays directed by Theatre personality and Vice President of Natto Chokro Mr. Golam Sarwar was held in Jatiyo Nattoshala, Bangladesh Shilpokola Academy. The play is written by Nasrin Mustafa based on the "KOMOLAKANTA" by famous novelist Bankim Chandra Chattyapadhaya. Music Direction by Enayet Mawla Zinnah. Props, poster and all other Design done by Mr. Deepak Roy. The Show was performed by Mustafizur Rahman, Promy Ashraf, Nur Islam Tipu, Abul Kashem Ratul, Pavel Kumar Saha, Jahirul Islam, Polash, Shahed, Babul, Kanon Ahmed, Limon Hossain, Farzana Yesmin Mukto, Rimon, Kaniz Sinthia, Emdad. Music Operated by Sanath. Make up by Jahangir. 20 May 2016: Nattyabed was invited by "Natto Niketon, Shirajganj" to perform the show of "Kamalakanto". Nattyabed performed the 5th show of "Kamalakanto" in Bhashani Milonayoton, Shirajganj in "Jug Purti Utshob of Natto Niketon". The play is written by Nasrin Mustafa based on the "KOMOLAKANTA" by famous novelist Bankim Chandra Chattyapadhaya. It is directed by famous director & cultural person Golam Sarwar. Music Direction by Enayet Mawla Zinnah. Props, poster and all other Design done by Mr. Deepak Roy. The Show was performed by Mustafizur Rahman, Nur Islam Tipu, Abul Kashem Ratul, Pavel Kumar Saha, Jahirul Islam, Polash, Shahed, Babul, Kanon Ahmed, Limon Hossain, Farzana Yesmin Mukto, Rabeya Rabu, Rimon, Kaniz Sinthia, Emdad. Music Operated by Sanath. Light operated by Mirza Samrat. 13 April 2016: Nattyabed performed the 5th show of "Kamalakanto" in Studio Theatre Hall of Shilpokola Academy. The play is written by Nasrin Mustafa based on the "KOMOLAKANTA" by famous novelist Bankim Chandra Chattyapadhaya. The play is directed by famous director & cultural person Golam Sarwar. Music Direction by Enayet Mawla Zinnah. Props, poster and all other Design done by Mr. Deepak Roy. The Show was performed by Mustafizur Rahman, Promi Ashraf, Nur Islam Tipu, Abul Kashem Ratul, Pavel Kumar Saha, Jahirul Islam, Polash, Shahed, Babul, Kanon Ahmed, Limon Hossain, Farzana Yesmin Mukto, Rimon,Kaniz Sinthia. Music by Sanath. 11 January 2016: Nattyabed performed the show of "Kamalakanto" in Studio Theatre Hall of Shilpokola Academy. The play is written by Nasrin Mustafa based on the "KOMOLAKANTA" by famous novelist Bankim Chandra Chattyapadhaya. The play is directed by famous director & cultural person Golam Sarwar. Music Direction by Enayet Mawla Zinnah. Props, poster and all other Design done by Mr. Deepak Roy. The Show was performed by Mustafizur Rahman, Promi Ashraf, Nur Islam Tipu, Abul Kashem Ratul, Pavel Kumar Saha, Jahirul Islam, Polash, Shahed, Babul, Kanon Ahmed, Limon Hossain, Farzana Yesmin Mukto, Rimon,Kaniz Sinthia. Music Operated by Sanath. Click here for a free hit counter .